We splurged, and got pretzels...how weird does that sound. Pre-gluten intolerance, we could buy pretzels in bulk at Sam's Club for near nothing, and now it's a splurge? That's life, I guess. Well, I wanted to vary the snacks that I pack for my little one, and pretzels was one we hadn't done. I prefer cereal...trix, kix, and chex are all good ones that are gluten-free and they are cheap compared to gluten-free snacks, but he eats his snacks better when he gets variety. Overall Rating: 9 out of 10. Delicious, but expensive, it cost $8-$9 for a 14-oz bag.
) So, I've heard really good things about Udi's, but haven't gotten around to trying anything from them until now. I had a coupon for their bread, so I thought it was worth a shot. I do really like my homemade bread, but it would really be nice for the sitter to buy bread for my little one, especially since she gets reimbursed by the state, it saves us all money! So, hence, the Udi's bread experiment. 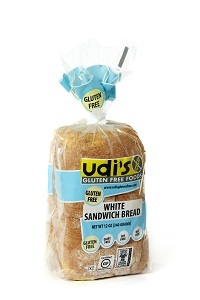 Lee's Marketplace is the only place in Cache Valley that carries the Udi's brand , and I will tell you now I will drive across town to do my gluten-free shopping there, it is worth it! The loaf of bread is small, but it is really delicious. I put a couple of slices in a baggie to take to the sitters, and had my little one hold it on the ride over...there was only one slice left when we got there, now that's a good sign that it's a tasty bread! I don't think it's the most nutritious bread out there (the tapioca starch is the first 'flour' listed), so I will keep making my bread at home, but now I know that I can buy a good-tasting loaf of bread when we are in a pinch. Overall Rating: 9 out of 10 It would've gotten a 10 out of 10 if it had a little bit more nutrition to it, but at least my little one will eat this one, and that's good. 2. 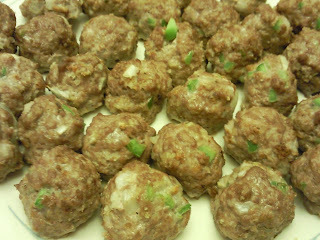 Combine all ingredients and form into 1" balls and place on cookie sheet. Bake for 15-20 minutes. 1. Mix dry ingredients together and add enough water to make a soft dough. 2. Roll out dough on floured surface (I used rice flour), making as thin as possible and cut into 4-5 pieces. 3. 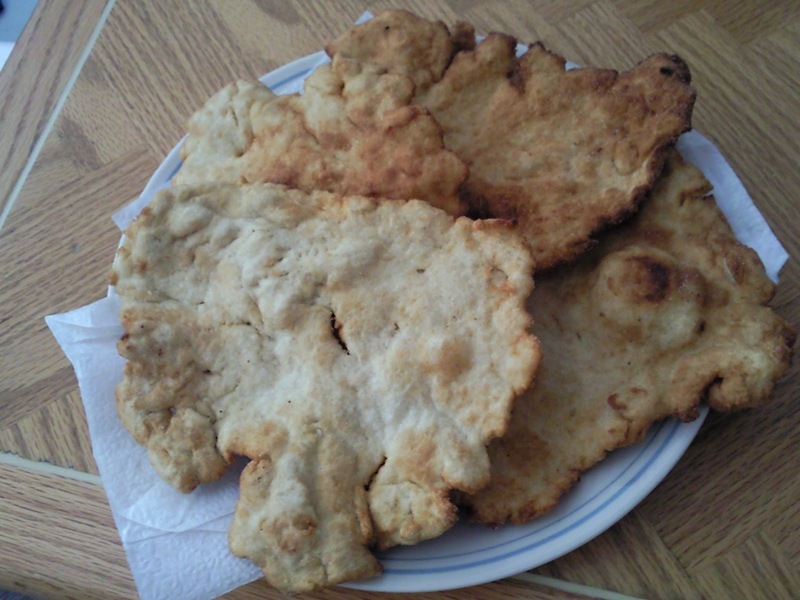 Fry dough in 1" of oil, turning once to evenly cook both sides. 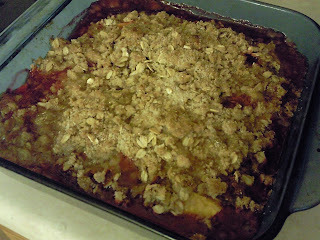 One of the biggest comfort food desserts for me is fruit crisp. My mom made apple or peach crisp all the time in the fall, it was probably one of the most common Sunday evening desserts that I had growing up, and its really easy to make, so it has become on of my favorite Sunday evening desserts to make. My boys have not yet realized the love of baked fruit, but my husband and I can nearly polish off an entire pan of crisp on our own, so maybe its good that the little ones aren't fighting us over it yet. :) The beauty about crisps is you can use whatever fruit you have on hand...I usually use apples or peaches, but will add in blackberries or raspberries when I have them on hand, like tonight. 1. Preheat oven to 375 degrees.Arrange fruit in 8 x 8-inch baking dish. 2. Combine the sugar, flours, oats, cinnamon, and nutmeg in a bowl; mix well. 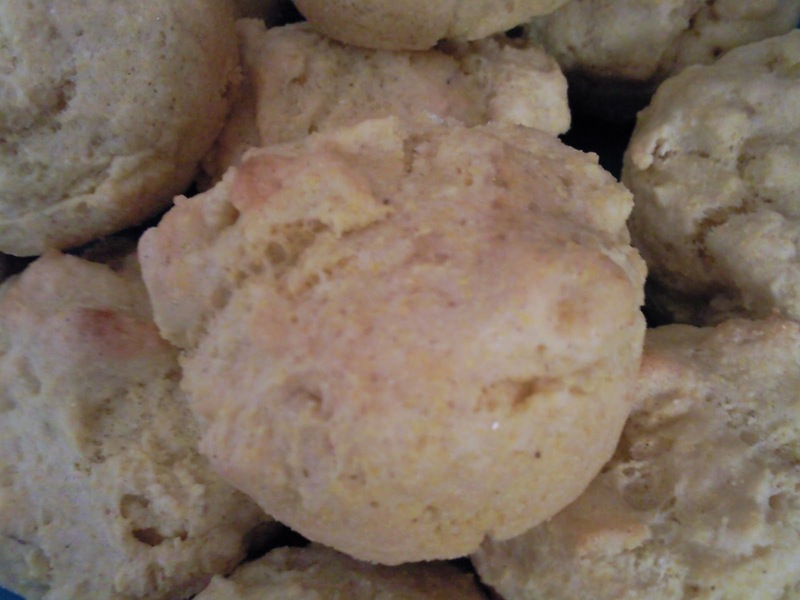 Cut in margarine until crumbly. This post is featured on Seasonal Sunday. 1. Cut squash in half lengthwise; remove and discard seeds. Arrange the squash halves, cut sides down, in a 2-quart baking dish (or on a cookie sheet). Bake at 350 degrees for 45 minutes. Turn squash halves cut side up. 2. Meanwhile, in a small bowl stir together the rest of the ingredients. 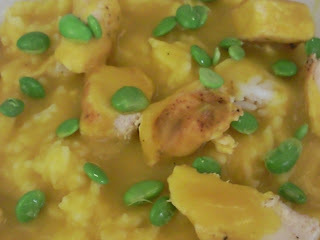 Spoon the mixture into centers of squash halves. Bake 20 to25 minutes more or until squash is tender. This post is featured on Gluten Free Holiday Thursdays. I knew when I was making the gumbo, there was a very good chance (pretty much 100%) that my older son would not even look at it, let alone try it. So, I needed some sort of side dish that at least he would try. What better thing to go with gumbo and rice, than cornbread? I found this recipe in the Incredible Edible Gluten-Free Food for Kids (if you don't own the book, you should, it is a good cookbook and resource! ), I followed the recipe almost exactly, just replacing milk with almond milk (I think in the future I would use soy or water, though). I did find the muffins a bit chewy, so I'm decreasing the xanthan gum a little in the recipe below. 1. In a medium-sized bowl, combine the dry ingredients. 2. In a small bowl, beat the eggs, milk, and oil slightly to combine. 3. Add the egg mixture to the flour mixture and stir until the batter is smooth. Do not overbeat. 4. 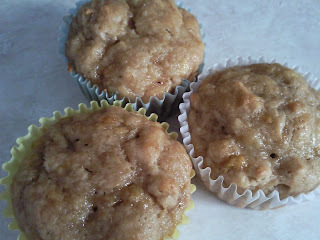 Pour into a greased 9 x 9 inch baking pan, or greased muffin pan. Bake at 425 degrees for 20-25 for bread and 12-15 minutes for muffins, or until golden brown and toothpick comes out clean. Nearly every Saturday I get a Bountiful Basket, it really has helped cut down on our grocery bill. Which is good, since the gluten-free products cost a bit more. 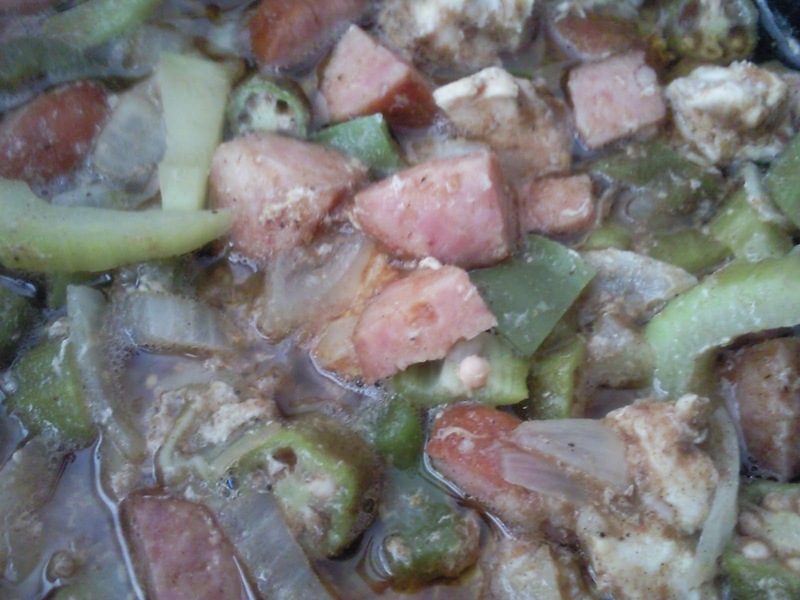 :) Well, this week I got okra in my basket...never have cooked okra, so when I first saw it a was a bit nervous, but then immediately thought...gumbo!! So, I made a traditional gumbo, served over rice and everything! I just wish my family was more willing to try new things...my husband eat some of the chicken and sausage, my little one enjoyed the sausage and rice, my older one through a massive fit over the whole thing, but no one was willing to try the okra in it...part poopers. :) I quite enjoyed it, and will be enjoying the leftovers throughout the week this week. 1. For roux, in a medium heavy saucepan stir together rice flour and oil until smooth. Cook and stir constantly over medium-high heat for 5 minutes. Reduce heat to medium. Cook and stir constantly about 10-15 minutes more or until a dark reddish brown color is reached; cool. 2. Place water in a 3 1/2 or 4-quart slow cooker. Stir in the roux. Add the rest of the ingredients, mix. 3. Cover and cook on low for 6-7 hours or on high for 3-3 1/2 hours. Skim off fat. Serve gumbo over hot cooked rice. My husband's birthday was yesterday, and though we are not huge cake eaters, I always make a big deal about birthday cakes, and that tradition is not about to die just because our cakes are now gfcf! 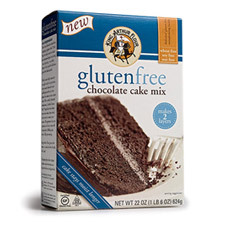 I was originally going to make a cake from scratch, but I won a $10 gift card to Fresh Market at my GIG meeting, so I spent part of it on the King Arthur's Chocolate Cake Mix , because I heard it was fantastic. And can I say, it is fantastic! It's moist and holds together well, and it's actually easier to shape than the cakes I've used in past birthday cake experiments...I think this may be our 'birthday cake' cake! The mix was around $5.50, so not cheap, but considering we have cake 4 times a year, I think the price is just fine, and it's a heck of a lot cheaper than buying one at a gluten-free bakery! Rating: 10 out of 10 definitely worth the price, the quality is good and it is simply delicious! Note: if you want chocolate frosting add about 1/4 C cocoa and a tiny bit more almond milk to the mixture above. Okay, I usually will make waffles from a mix or from scratch, but I bought these with my daycare in mind...they eat waffles or pancakes once a week, and so it would be a lot easier for both of us if they can just buy gf waffles. And after trying these waffles, I may just buy waffles from now on, instead of making them. ;) They were really, really good; crispy, yet chewy on the inside--just how I like them. I got them at Smith's on sale for $2.50/box of 6. Rating: 10 out of 10 for making my life easier and tasting exactly how waffles should taste! Okay, I've been busy tonight, this is the 3rd post this evening...Wednesday nights are spent baking and getting things ready to take to day care, etc., hence, the play dough. Play dough is one of my little one's favorite things to play with, but not so healthy now that he's gluten-free. 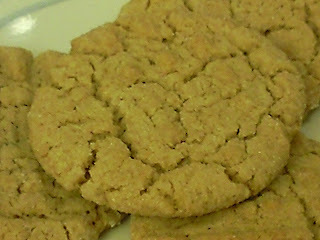 I found this recipe in the Incredible Edible Gluten-Free Food for Kids cookbook (I really love this book! ), it's super easy, and it smells good, too! 2. Add the oil and the warm water to the flour mixture and mix well. 3. Heat the mixture on medium heat for about one minute or until the mixture thickens and pulls away from the sides of the pan. Remove from heat. 4. Turn the dough out onto a cornstarch-floured board. Knead in enough starch until the dough is no longer sticky. 5. Store in an airtight container when not in use. It will last longer if stored in the fridge, too. 6. If the dough becomes too think or slightly dry after use, heat it in the microwave on high for about 30 seconds and knead. 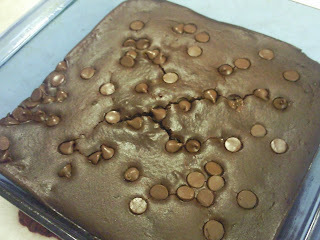 I figured that was a funner name for these brownies than what they were originally named...Black Bean Brownies. 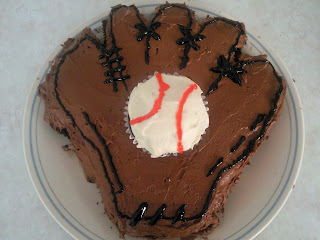 :) I think my boys are more likely to eat Ba, Ba, Brownies, don't ya think? I actually made these for my youth group at church. We have a couple of girls that are gluten free/casein free, so this recipe was perfect (and I get to enjoy them, too!) I had gotten a few different Black Bean Brownie recipes, but I ended up settling on this one, it's from the The Meal Makeover Moms and was super easy. 1. Preheat oven to 350F. Lightly grease an 8 x 8" baking pan and set aside. 2. Place the black beans in a blender or food processor (If you are doing it in a blender you will need to add the eggs before blending), and process until smooth and creamy. Add eggs (unless you already did, with the blender), oil, sugar, cocoa, vanilla, peppermint if desired, baking powder, and salt and process until smooth. Stir in 1/4 cup of chips. 3. Pour the batter into the prepared pan, smooth the top with a rubber spatula, and sprinkle with the rest of the chocolate chips. 4. 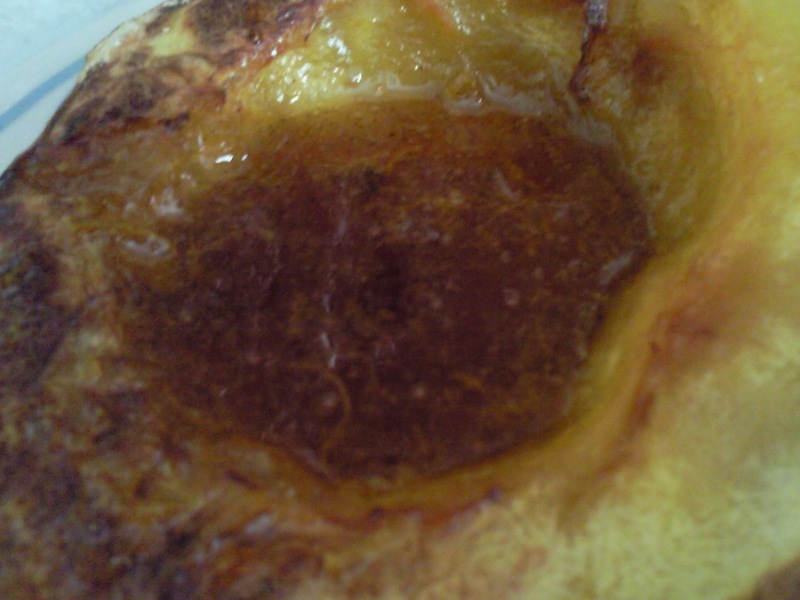 Bake 30-35 minutes, or until the edges start to pull away from the sides and a toothpick comes out clean. Cool in the pan before slicing into 2" squares. 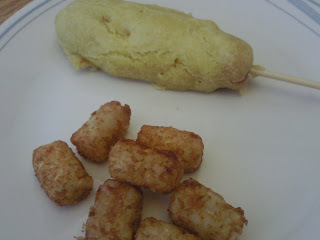 So, I already have a corn dog recipe on here that's really easy, but doesn't totally taste like you're typical corn dog. So, I found this recipe in the Incredible Edible Gluten-Free Food for Kids cookbook and thought I would see how it would compare to regular corn dogs. They definitely have more of that cornbread taste to them...I need more practice battering and deep frying, but they turned out okay. I did both full size corn dogs on a stick and the mini corn dogs (I think the mini ones are easier to do). 1. Pat hot dogs dry with paper towels. If desired, insert a wooden skewer into one end of each hot dog. Or, if you want to make mini dogs, cut each hot dog into 4 or 5 pieces. Set aside. 2. In a shallow bowl or pie pan, combine dry ingredients. 3. In another bowl, combine egg, milk, and 2 T oil. Add to dry ingredients and mix well. The batter will be thick. 4. Measure 3/4-inch of oil into a deep frying pan. Heat to 375F. 5. Put some extra rice flour on a shallow plate. Roll hot dogs in the flour, then coat the hot dogs with the batter. 6. Fry hot dogs, a few at a time, turning with tongs about every minute, until golden brown. Drain on paper towels. Last night I attended my first support group meeting, the Cache Valley Gluten Intolerence Group (GIG) held their monthly meeting last night. It was at Fresh Market, so we got to see what they offer there and have some samples...I love samples, and so do my boys. :) Also, they had a drawing for gift cards to Fresh Market and I won $10, which I promptly spent on GF treats. :) I learned some things from the other members, some things I'm still taking in and digesting...so I won't mention them now, but one thing I'm quite excited about is that the Kroger Value brand semi-sweet chocolate chips is dairy-free! I also with the Great Value ones (Walmart) are as well, but haven't checked. I've never loved cheap stuff so much before! I really never thought of checking the labels, all the other brands have milk or could be cross contaminated with milk, so I assumed if I wanted chocolate chips I would have to fork over the $5-$6 for dairy-free ones at the health food store. So I just bought 3 bags for $1.69 each, and I'm feeling pretty good. (I did call Kroger and they wouldn't guarantee that they are dairy-free, but said that if there was any chance of cross contamination they are required by law to put that on the label). So, we also got to try a few gluten-free products last night. They had ham from the deli--all of there deli meats are gluten-free, the Kretchmer brand say right on their label gluten-free and MSG free, so that may be my new favorite brand! 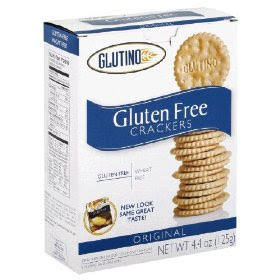 We also had Glutino Original Crackers , which are the gluten-free version of Ritz Crackers. They were delicious, they are a bit harder than Ritz crackers, but the taste is pretty much the same, and it goes perfectly with ham. 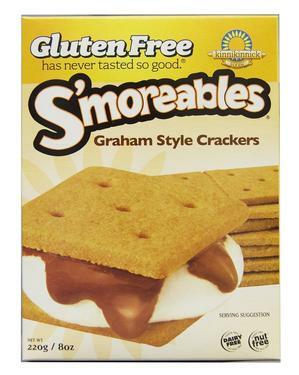 ;) I would rate both of these at at least a 9 out of 10 the ham because the brand labels it gluten free and MSG free and the crackers because they taste like regular crackers. One problem with the crackers for millk sensitive people...there is no milk in the crackers, but there is potential for cross contamination, it says on the label (and I did get sick last night and I'm guessing it was the crackers and the wafers cookies). 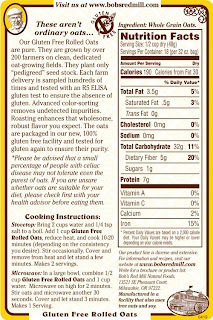 But for those of you with only a gluten sensitivity, this won't be an issue. We also got to try two types of cookies. 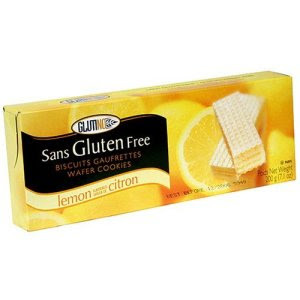 I mentioned the wafter cookies above, they were Glutino Lemon Wafer cookies , and they were really good. The boys weren't huge on them, but they aren't lemon fans, so that didn't surprise me. I, on the other hand, love lemon, so they were incredible. The wafers had the texture of regular wafer cookies, so I may buy the boys the vanilla, chocolate, or strawberry ones for treats. I would give this a 9 out of 10, they were delicious and had the perfect texture. The other cookie we tried was by far the favorite for all of us. It was the kinnikinnick K-Toos Vanilla Sandwich cookies . 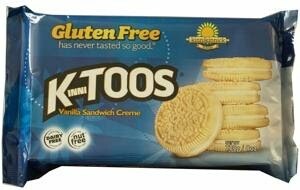 They basically are 2 of their K-Kritter with dairy-free creme in between them...yum!!! My boys had to have had at least 3 cookies a piece, we then purchased a pack (with the giftcard I got) and went home and ate at least 3 more a piece...way too many cookies, but so good! These get a 10 out of 10 for their pure awesomeness! Blend the soy sauce, oil, ginger, mustard, garlic and brown sugar together in a blender. Put meat (I cut my chicken and beef into strips) in a large ziploc bag, cover with marinade (reserving a few tablespoons), and place in fridge. 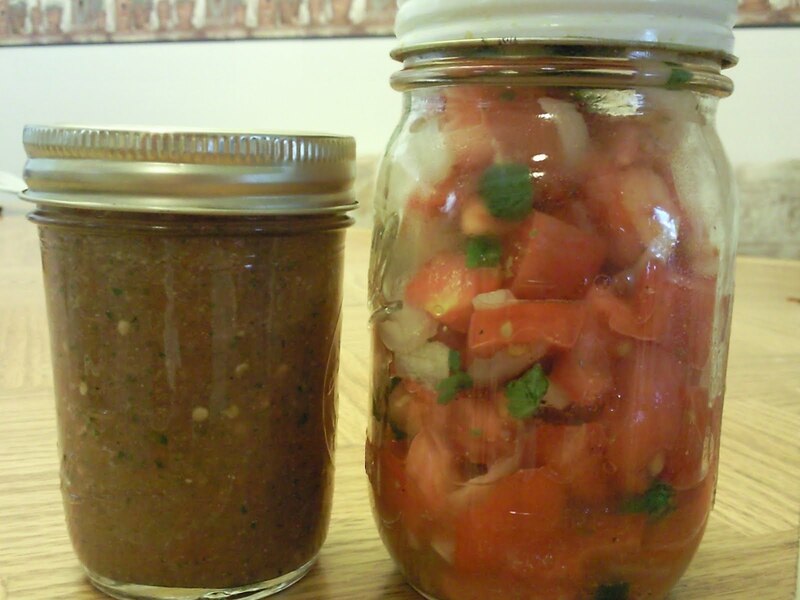 For chicken or beef marinate 6-8 hours, for salmon marinate 2-3 hours. Broil or grill for 8-10 minutes, basting every few minutes. So, this weekend I went to Gluten Free Foods in Layton this weekend. They were having their 1 year anniversary, so they had cake (gluten-free, dairy-free), samples from area bakeries, and a clown that did face painting and animal balloons. It's a small store, and a could probably find most of the items here in the valley, but it was nice to see what options I have. Because of that trip, I do have a few reviews. This one is for the S'moreables , I love graham crackers--plain, dipped in milk, or covered in icing, or about any other way I can think of, so I really wanted to try these. I love them, you can taste the molasses in them...so if you're not a molasses fan, you may not like them. They have a bit of that chalky texture, but it didn't stop me from eating them. But my boys took one bite and they were done, so I think it takes getting used to for kids. I'm sure if I made smores or put frosting on them they would eat them, so I'm not too worried. Rating: 8 out of 10 They were really yummy, but they do have that chalky texture to them, and my boys aren't totally on board with them yet. 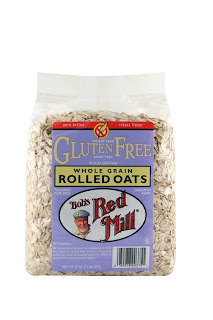 So, oatmeal is one of those iffy grains for gluten-free people, but if you buy the certified gluten-free oats, you can have wonderful comfort foods using them, like meatloaf or even just oatmeal for breakfast...its amazing how you take those little things for granted. Well, I've been trying a few things and having my little one try them as well. So, now I can review some oatmeal products for you. 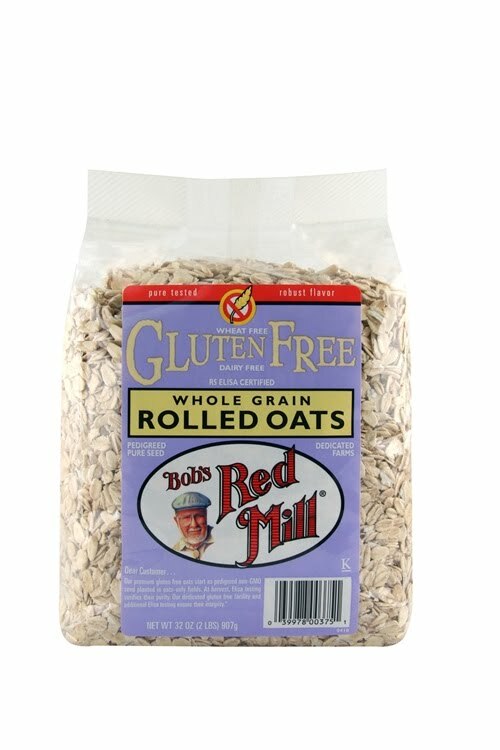 First up is Bob's Red Mill Gluten Free Rolled Oats . I love them! It's oatmeal, plan and simple. If you want oat flour, grind them, they are as versitile as oatmeal is and my son still gets his oatmeal once a week for breakfast. Of course, we have to add plenty of brown sugar too it, and I actually pulse it once or twice in the blender to break it up a little before cooking it...but still, we have oatmeal! It's a bit pricy, you'll probably pay between $5-$6, but it is so nice to have on hand! Rating: 10 out of 10! 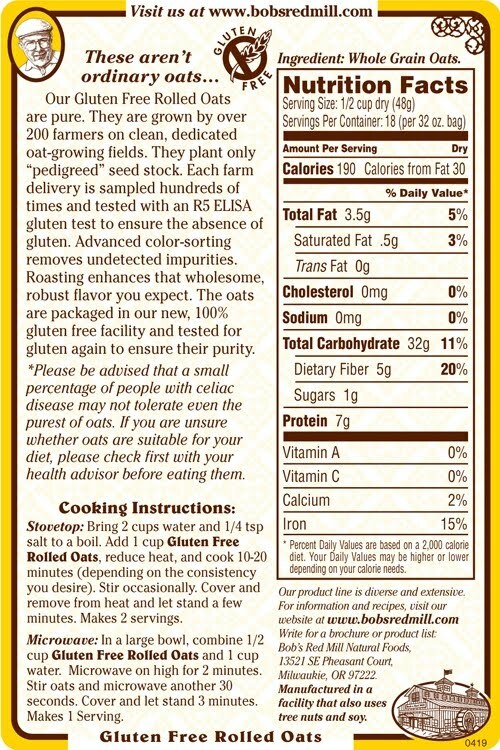 For the fact that we have regular oats that are certified gluten-free. 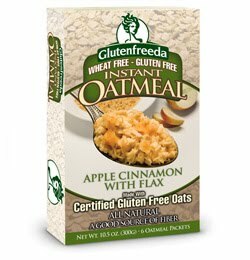 Next up is Glutenfreeda Instant Oatmeal: Apple Cinnamon with Flax . (I also bought the Banana Maple with Flax, but haven't tried it yet). Another great investment, I love to open a packet of instant oatmeal, add water and microwave. It was really good on top of that, excellent, excellent product. I got mine on sale for $3.80 and one box contains 6 packets. It's a little bit more expensive than you're Quaker oatmeal, but not by that much. Rating: 10 out of 10 It's ease of use...I can send a packet with my son to Day Care, it makes my life so much easier and it tastes good on top of that! Slowly mix dry ingredients into liquid mixture. 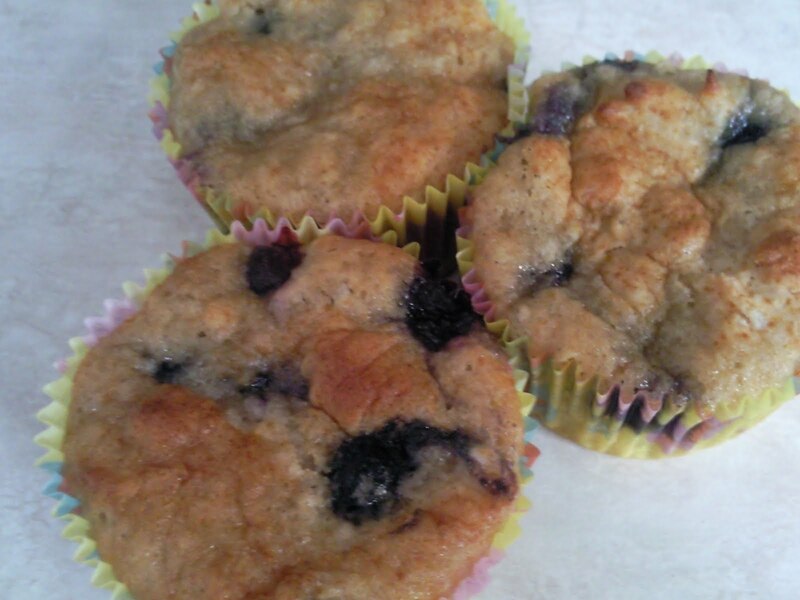 Spoon batter into lined or greased muffin tins or bread pan and bake for 20-25 minutes for muffins or 60 minutes for bread. I had some leftover coconut milk from my butternut squash soup and hate to see things go to waste, so I made some muffins. This was my first attempt at converting a regular muffin recipe to gluten-free and it worked! If you are not a fan of honey (I know there are some of you out there), add 1/2 C+2 T white sugar and 2T more of coconut milk in its place. I have this post linked on Cybele Pascal's Allegry-Free Cuisine blog for 4/1/11, you can see it and other great allergy friendly recipes here. Preheat oven to 400F. Combine coconut milk, egg, honey, and vanilla in a bowl and mix thoroughly. In a separate bowl mix together dry ingredients. Add dry ingredients to the wet, mixing just intil moistened. Fold in blueberries. 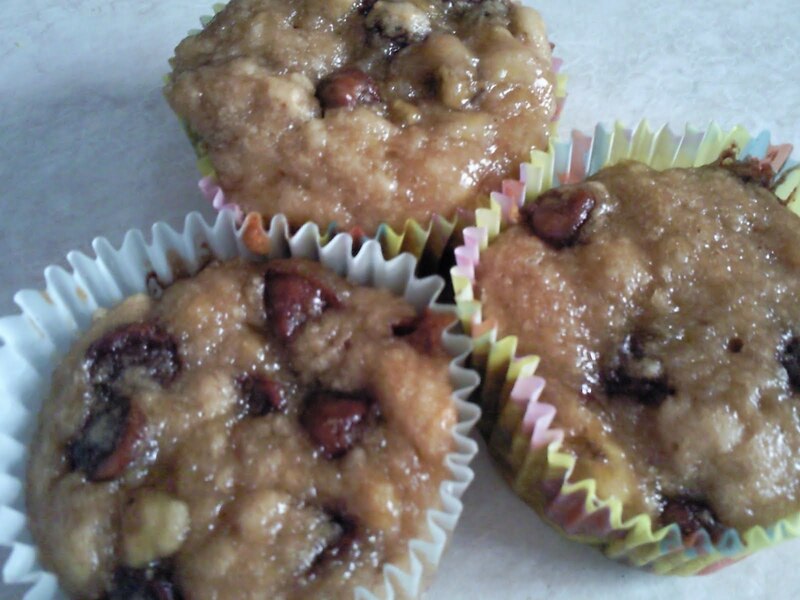 Pour into lined or greased muffin tins. Bake for 15-20 minutes. If you can't guess by the title and by reading previous posts...I used my leftover Curried Butternut Squash Soup and turned it into a curry sauce for my chicken and rice dinner tonight. I spiced up some chicken breasts and grilled them, then chopped them up. For the rice, I used basmati and cooked it in Chicken Broth that I had left over from making the soup and put a bay leaf in there also. I threw some soybeans in the mix as well, since I have a ton from my garden right now...so good! Once again, I was the only one willing to try it, but I think I like even better as a sauce than as the soup. So this recipe is definitely versatile! The boys had a friend over this evening, and I should have taken that free time and cleaned the house, but instead I made cookies. My excuse is that I'm making them to freeze and have on hand for my little one to take to day care and also for the girls at church who are gluten-free/casein-free...I found the recipe at www.gfutah.org and just like with the snickerdoodle recipe, I didn't have the preblended flour, so I modified their recipe below taking that into account. 2. In large bowl with mixer at medium speed, beat peanut butter and shortening until smooth. Beat in sugars until blended. Add eggs and vanilla. Add flour mixture, mix until well blended. 3. Shape dough into 1-inch balls and roll in sugar. Place 2 inches apart on ungreased cookie sheets. Flatten with fork, making crisscross pattern. 4. Bake 10 to 12 minutes or until lightly browned. Remove, cool completely on wire rack. Store in tightly-covered container. 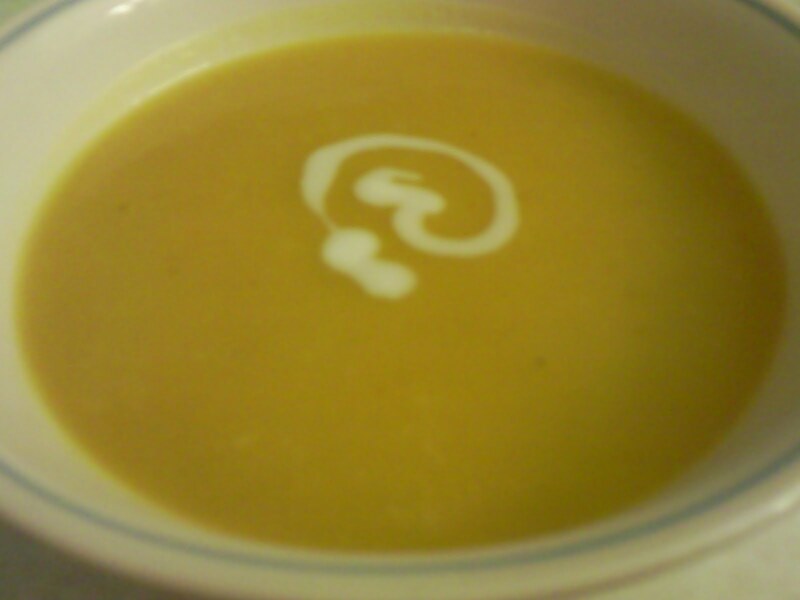 Nothing says autumn like soup, especially squash soup. I found this recipe and modified it for the crockpot. I still haven't been able to convince my family that food cooked with curry and coconut milk is heavenly...but that just means more for me. I served it with sandwiches in hopes that they would at least dip their grilled cheese in the soup, but no, I'm still the only one that likes squash and curry. I think I may use some of the leftover soup as a sauce for chicken and rice tomorrow (meaning I'll use it and they can have chicken how they want it), I'll let you know how that goes. Add the onion, celery, curry paste, squash and broth to a crockpot. Cook on low for 6-8 hours. Puree the soup with an immersion blender (or if you're like me and don't have one, use a regular blender and do it in batches) till smooth. Stir in coconut milk. Season with sea salt and pepper, to taste. Warm through gently and serve. So, from the previous post you know I made fish tacos, well, I used the extra tilapia fillets to make fish sticks for my little one to eat at day care tomorrow (since that's on the menu). 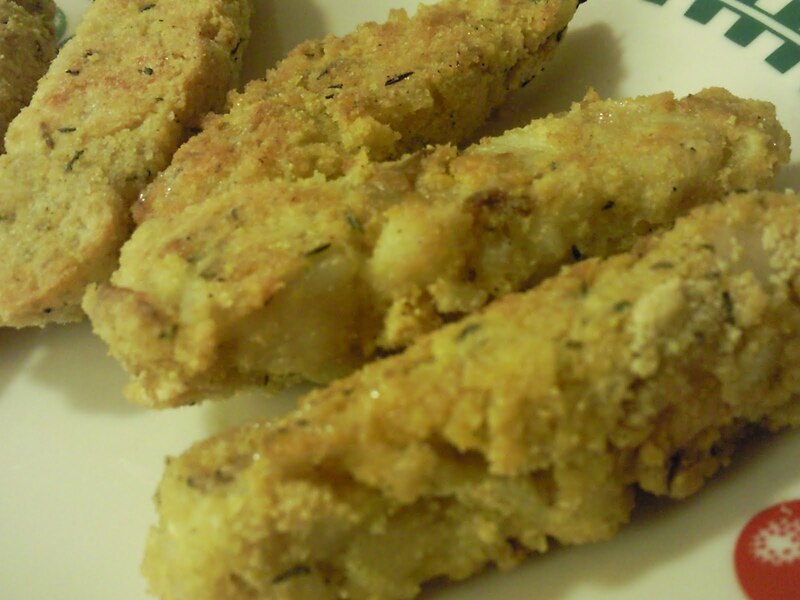 I basically modified the chicken nugget recipe, but it seemed to work, it definitely tastes a lot better than store bought fish sticks. 1. Preheat oven to 400 degrees, grease a cookie sheet. Mix egg in a small bowl and set aside. 2. In another small bowl, mix together corn flakes or bread crumbs, flour, thyme, garlic powder, onion powder, salt, and pepper. Pour about 1/3 of the mixture on the edge of a plate. 3. Flake fish into tiny pieces and place in a bowl, add a little bit of the mixed egg and some flour and mash together until it binds well together. 4. Shape fish into finger-sized sticks. Roll in flour mixture on the plate. 5. Take each "floured" stick and dip it in the egg, then roll it in the bowl with the rest of the breading and place it on the cookie sheet. 6. Cook nuggets for 12-14 minutes, turning halfway through. Season fish with salt and pepper and broil under high heat for 3-4 minutes on each side, or until done. While fish is cooking combine mayonnaise and salsa to make a sauce. 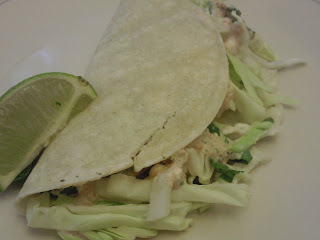 Cut fish into pieces, place in corn tortillas and top with cabbage, cilantro and the salsa sauce, squeeze lime over top and enjoy! 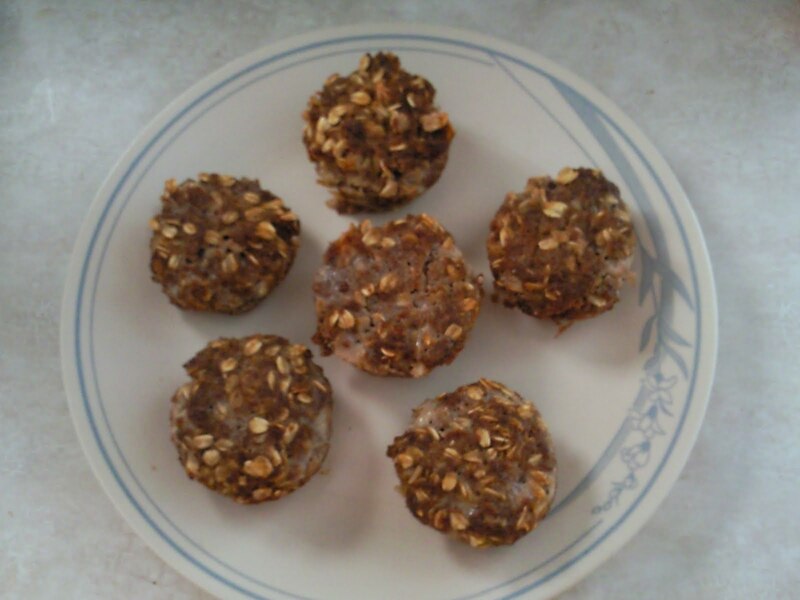 Mix together and put in a greased bread pan or in muffin tins (I like meat muffins, because they cook a lot faster and they are already in individual servings). Cook at 350 degrees for 50-60 minutes for a loaf or 20-30 minutes for muffins. Blend almonds and 1 1/2 cups water. Add remaining ingredients and blend. Strain through cheesecloth. I like soy milk better, but this helped me stretch my soy milk out longer...it was actually fantastic as a 50:50 mix with my soy milk. Okay, I may be a little obsessive with my blogging right now, but if it helps one person than it's worth it--even if that one person is me, thinking, "What was that brand of corn tortillas that I liked?" 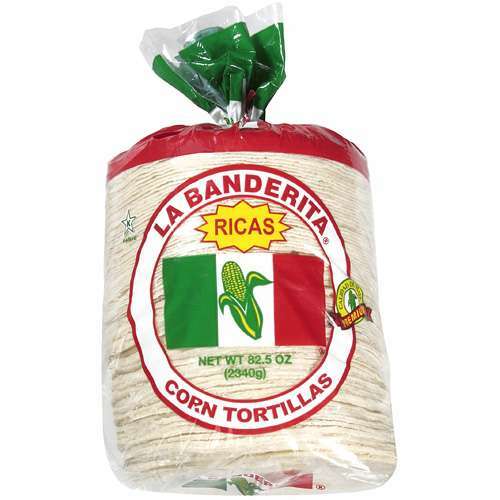 I love corn tortillas, but they tend to fall apart, especially when you are doing anything with them! So, I was delighted to find out that La Banderita White Corn Tortillas don't fall apart, at least not nearly as often as other brands I've had. They are flexible, so you can actually make wraps, enchiladas, and burritos with them, and on top of that they taste really good, my 5 year old will even eat them, so that's saying something. 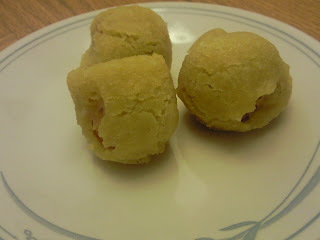 His favorite way to eat them (and one of mine) is rolled up with ham...that's it, so simple, yet that combination of mild corn and ham is sooo good. I buy the large count and freeze them in sets of 10, so they last longer. Rating: 10 out of 10 This one is definitely a keeper! So, tonight was one of those nights I really didn't feel like cooking...and if I could have I probably would have ordered pizza. 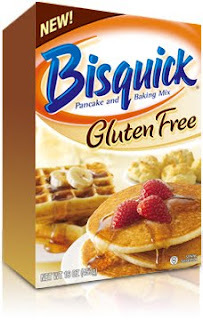 But, I really didn't want a double whammy from eating both gluten and cheese, so I pulled out the box of gluten-free bisquick that I bought the other day at Macey's (by the way, it's not with the gluten-free foods, it's by the other Bisquick boxes...go figure). On the box was a recipe for pizza crust, so I thought I'd give it a shot. 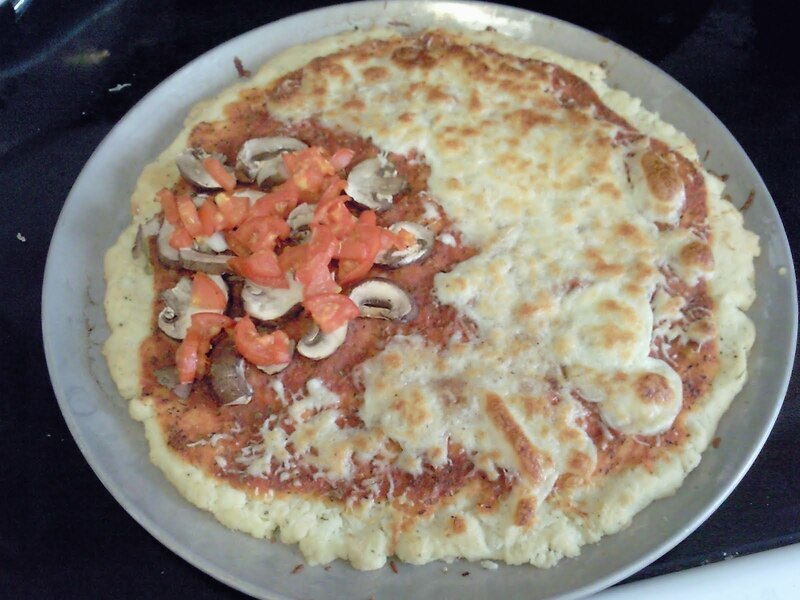 I topped it with this pizza sauce, cheese over 3/4 of it and on my section tomatoes and mushrooms (since I can't have cheese). I do like the taste of the crust...no strange tastes or textures with it, it really was pleasant to eat. 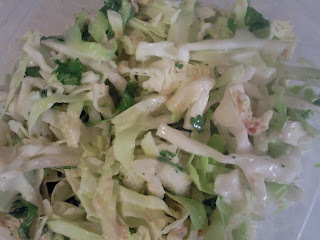 I will review it again as I test it in different recipes. Rating: 7 out of 10 I really enjoyed it, the mix made life a little easier (meaning, I didn't have to measure quite so many flours) and I got my 2 year old to eat something (but couldn't get my 5 year old on board with it). I would make it again for at least the gluten-free family members.